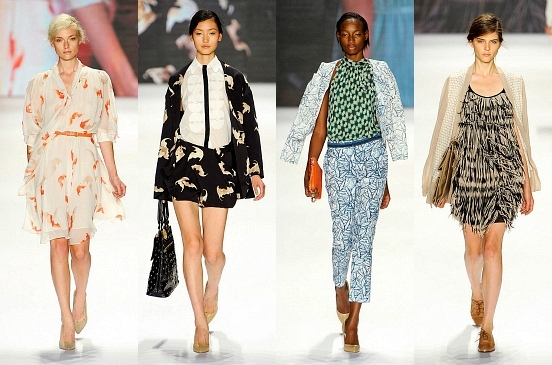 Designer Vivienne Tam‘s Spring 2012 collection was inspired by a zen garden. As such, her designs featured organic shapes and neutral fabrics juxtaposed with lots of punchy prints and pretty florals, creating the perfect springtime ensembles. Bright colors are definitely in for spring and this look from Vivienne Tam features them prominently. This trendy pink and orange color-blocked dress is adorned with a floral applique for a fun and flirty vibe, while the neutral accessories keep it from looking too over-the-top. Instead of using a color-blocked dress, you can easily achieve a Vivienne Tam-inspired look by pairing a tangerine skirt with a pretty pink top. To balance out all those bold colors, add some neutral-colored flats and an oversized tan satchel. Accessorize with some gorgeous pave earrings and a classic tortoiseshell watch for a springtime-appropriate look. Florals are always popular for spring, but Vivienne Tam freshened up this springtime print by incorporating lots of bright colors. She then dressed down the look by adding a lightweight coat and oxfords for an ensemble that’s perfect for the breezy spring weather. Mimic this look by choosing a colorful floral print frock, like this one from ModCloth. 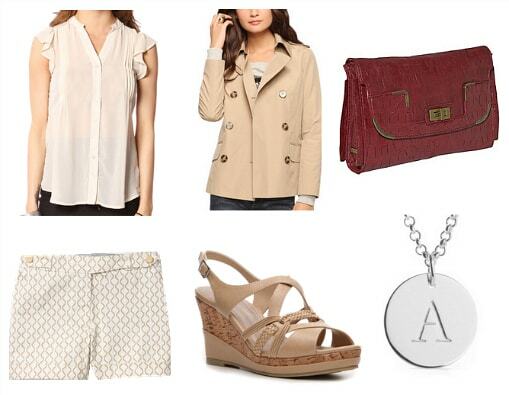 Pair the dress with some masculine lace-up oxfords, then add a lightweight, camel-colored coat. Next, add a pretty blue bag that picks up on the colors in the dress. For the finishing touch, add some delicate jewelry, like this bow-shaped ring and some pearl studs. Wearing an all-neutral outfit can be boring, but Vivienne Tam made this ensemble look chic and eye-catching by incorporating diverse textures, prints and layering tricks for a trendy, modern vibe. For this look, start by pairing a sheer blouse with some geometric-print shorts. Next add a lightweight, cropped trench and a pair of tan wedges. Accessorize with a silver necklace adorned with your initial, then for the finishing touch, add a burgundy clutch. What do you think of this collection? Are you a fan of Vivienne Tam? Which look is your favorite? Would you wear any of these outfits? Which designers would you like to see featured here next? Remember to leave a comment below and let me know what you think!